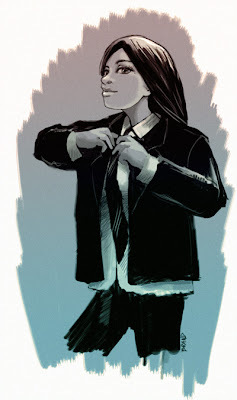 Butterscotch and Doodles: Illustration Friday Word: "Suit"
I've finally managed to update my blog. :-) Sorry for the delay ! Je suis enfin parvenu à mettre mon blog à jour ! Quelle performance incroyable. Désolé pour le retard! Lovely drawing! I like her gesture and the movement of her pose! mardi, juin 12, 2007 10:46:00 p.m. I like the expression of the illo..the character is very much acomplished..the style gives it strengh! mercredi, juin 13, 2007 10:43:00 a.m.
mercredi, juin 13, 2007 5:57:00 p.m.
mercredi, juin 13, 2007 9:05:00 p.m.
beautiful, love the expression on her face! mardi, juin 19, 2007 3:26:00 p.m.